Optical surface measurement system for quick non-contact measurement of topography and complex geometric models in the nano-, micro-and macro-range. Compact stand-alone laboratory instrument, including PC. Used in; research and development, acceptance testing, quality control and failure analysis. Analysis of roughness and structure determination on flat or curved samples, structured or smooth. 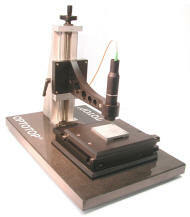 Measurements of macro and micro geometry and flatness control.